"We don’t want to be Europe’s nuclear waste dump" - Border communities resist being burdened with toxic waste with a half-life of of 50.000-500.000 years. In 1987, the Spanish government began to study the possibility of a pilot project to establish a nuclear waste storage site near its border with Portugal. 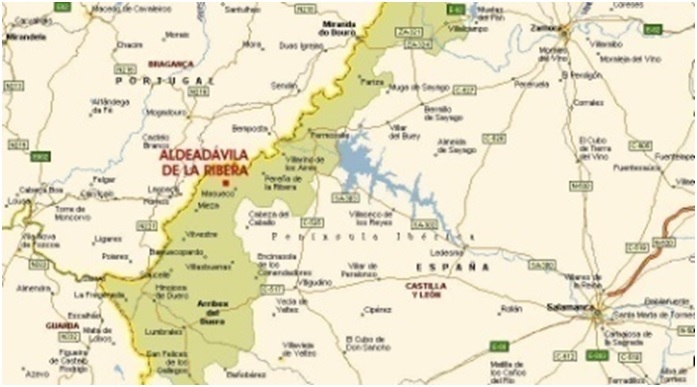 The site for the proposed project was Aldeadávila de la Ribera (Zamora, Spain), a village located in the International Douro Nature Park and four kilometers from the Portuguese border. At the time, the Douro River supplied water for roughly 5 million Portuguese people, or around half of the population. Experts on the matter criticized the site chosen, since they were worried about technical conditions such as the area’s seismotectonic activity and the granite’s permeability. They feared that the pilot laboratory and the highly active nuclear waste stored in this stone would not provide required isolation for the amount of time (50,000-500,000 years, depending on the life span of some isotopes contained in such waste) necessary to ensure that it decays to levels that are harmless for people and the environment. Furthermore, inability to meet the seismotectonic stability criteria of the International Douro’s domain, where Aldeadávila is located, was also a restraint. The project required another US$ 5.6 million of European Community funds to be invested. 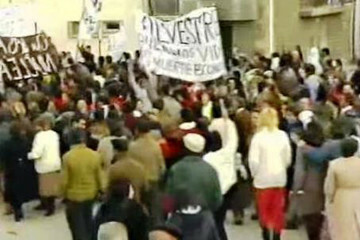 This led to street protests in which approximately 3,000 people participated in Zamora. 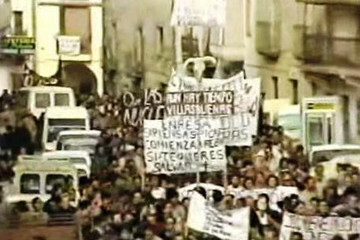 Only one day later, this number rose to 30,000 Spanish and Portuguese activists protesting in Salamanca, halfway between the border and Madrid. Their slogan was: "We want hospitals, culture and progress. We don’t want to be Europe’s nuclear waste dump". The project was suspended until further studies could be carried out. Eleven years later, in 1998, the demonstrations returned following a complaint made by the Antinuclear and Environmentalist Committee of Salamanca that claimed that the border area was under consideration again as a possible storage site. The Association of Municipalities of Trás-os-Montes and Alto Douro promoted a march along the riverbank on the Portuguese side of the International Douro Nature Park. The Spanish and Portuguese wanted to draw attention to the fact that Aldeadávila was inside an international conservation unit: a nature park. What gave origin to this denouncement was a bill under discussion in the Spanish Senate that would give full powers to Spain’s National Radioactive Waste Company, ENRESA, to unilaterally define the location of a nuclear waste site. 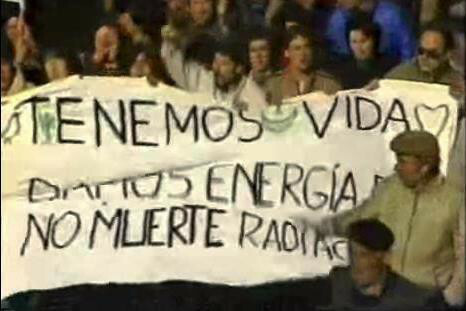 Since then, the Government of Spain has attempted, via ENRESA, to find a solution for the disposal of nuclear waste. Some of the Portuguese mayors of the Bragança district, near the border, suggested that the right thing would be to find a location closer to where nuclear energy is used, such as Catalonia or Madrid. The project has been cancelled due to strong protests and as a safety measure, and a permanent storage solution remains to be found. The same region is also a site of interest for uranium mining companies. In 2013, the Portuguese ecologist party “Os Verdes” presented a petition to parliament questioning the licensing process underway for a uranium mine project in the region of Salamanca (about 100 km from the Portuguese border) to be executed by Berkeley Minera España, S.A. No environmental impact assessment has been carried out for this project. At the same time, this company also requested the reopening of the Retortillo-Santidad mines. The mines are located near the border in a Special Protection Area for birds and a Site of Community Importance. The debate on the risks of nuclear energy, which includes both the storage of nuclear waste and uranium mining near Portugal’s border with Spain continues. In 2014, a round table on the issue "Uranium mining in Salamanca and health effects: the Portuguese experience" was organized by the Spanish ecologist party, EQUO, and the Stop Uranium Platform. Members of the Association of Former Workers of Uranium Mines and the Association of Uranium Mining Areas of Portugal attended the event. In 2016, plans to establish open-pit uranium mines, a uranium processing facility (in Retortillo), and a radioactive waste deposit (in Aldeadávila) were announced. The cross-border territory that would be affected is part of the International Douro Nature Park, the Meseta Ibera Biosphere Reserve (declared by UNESCO as part of the biosphere network), and Natura 2000 network. It is of important ecological value. In March 2017, the Ministry of Energy of Spain suspended the authorization process for the uranium processing facility. Development of Alternatives To find a location near to where the nuclear energy has more usage, like Catalonia or Madrid. Why? Explain briefly. The project was cancelled and the nuclear waste storage site was not built. EXPRESSO PORTUGAL. Exploração de urânio em Espanha pode afetar Portugal. 09 jun. 2013. AGENCIA LUSA. Bragança rejeita cemitério nuclear espanhol junto da fronteira.Diário Digital. 3 de Agosto de 2006. LA CRÓNICA DE SALAMANCA. Berkeley da un paso más para abrir la mina de uranio en Retortillo, 24 abr. 2014. REYNA, Patrick. 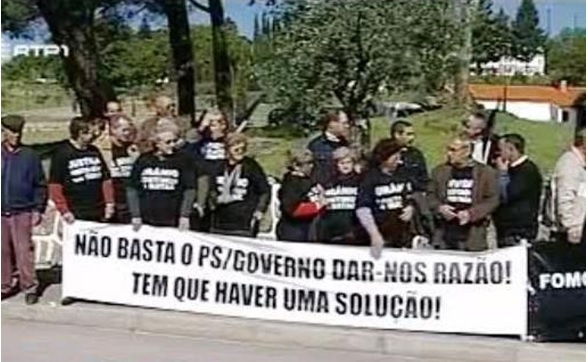 Portuguese protest Spain's search for nuclear site near border. The Associated Press. 07 Jun. 1987. News Article. LUSA. Municípios raianos contestam construção de mina de urânio próximo de Salamanca. Diário de Notícias. 18 mai 2017. News Article. TSF. Depois de Almaraz, há um novo "conflito" nuclear perto da fronteira portuguesa. 18 abr. 2017. EJATLAS. Open air mine explotation of uranium in Spain-Portugal border. EJatlas.org. 2018. News Article. EXPRESSO. Milhares de pessoas protestam contra mina de urânio em Retortillo. 24 dez. 2018. News Article. LUSA. Os Verdes alertam na Guarda para exploração de urânio junto à fronteira. RTP notícias. 20 out. 2016. News Article. LUSA. Ambientalistas insistem no risco de mina de urânio espanhola e querem posição do Governo. Diário de Notícias. 18 mai 2017.